Before traveling alone with your grandchildren, spend a little time getting to know them. Take them for a day trip or two; have them stay over for a weekend; try a one- or two-night local trip first. Be sure they're comfortable with the idea of traveling with you without their parents. It's best to take one grandchild at a time, two at the most. Taking cousins together can be better than siblings; they're less likely to fight. Review with the children's parents any of the kids' special needs like medications, allergies, diet, rest, and even favorite (and "won't eat at all") foods. Let your grandchildren help plan the vacation, and keep the first one short. Be flexible and avoid over-planning by building in free- and/or down-time. Discuss mealtimes and bedtime beforehand. Fortunately, many grandparents are on an early dinner schedule, which works nicely with younger children. Also, if you want to plan a special evening out, make reservation ahead of time. Stash some crayons and paper in your bag to keeps kids occupied in restaurants. Gear plans to the kids' ages; if they're not happy, you're not happy. Call the parents when you first arrive at your destination, and call periodically after that. Have the kids speak to mom and dad. Everyone will feel better - and it's good for the kids to share their adventures with their folks. By choosing a vacation that offers some supervised kids' activities, you can gain a much-needed rest. If you're traveling by car, especially with teens, we highly recommend portable CD-players and headphones. Teenagers' musical tastes differ vastly from most grandparents', and it's simply more enjoyable when everyone can listen to their own music. Carry the kids' health insurance information and a notarized statement from parents for permission to obtain medical care in an emergency. Tell your grandchildren about any medical problems you may have so that they can be prepared if there's an emergency. Pack basic first aid items - including a washcloth, tissues and some extra toiler paper. "The best laid plans of mice and men..." When life throws you a curve - illness, bad weather, unscheduled attractions closings, whatever - you can still thrive if you have an alternate plan and stay positive. Assimilate the challenge and make it part of the adventure. Many attractions and hotels offer discounts for seniors. Check ahead of time for bargains. As noted earlier, organized grandparent/grandchild travel is becoming more common. Often, a cruise makes the perfect venue - plenty of daily activities for everyone, but other activities are shared, as are mealtimes. 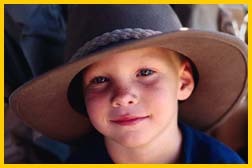 Look into Elderhostel (1-877-426-8056, www.elderhostel.org), which offers intergenerational programs. Or, if planning a child-friendly trip seems overwhelming, try Grandtravel (800-247-7651; www.grandtrvl.com) a tour operator/travel agent aimed at kids and grandparents.